Abraham Kovoor’s Case Diary: Lady Wonder: A Mind-Reading Horse! "The animal, subject of the experiment herein described, is a three-year-old filly, Lady Wonder, owned by Mrs. C.D. Fonda of Richmond, Virginia. According to re­ports which led to our enquiry, the horse could make predictions, solve simple arith­metic problems, answer questions aptly and intelligently, and do all these without verbal commands. All what was needed was that the question be written down and shown to Mrs. Fonda. In Mrs. Fonda's opinion these accomplishments of the horse were due to a combination of unusual intelligence and the capacity for mind-reading". "Our Experiments were begun on December 3rd, 1927, and ended on January 15th 1928, covering In this period a total of six days. The tests were made at the residence of Mrs. Fonda in a demonstration tent 9 x 12 feet. "Professor William McDougall was present and participated in the experiments on two days and the Assistant Superintendent of District Schools Mr. John F. Thomas on one day. Others present were Mrs. C.D. Fonda, Dr. J.B. Rhine, and Dr. Lousia Rhine". "There is left only the telepathic explanation, the transference of mental influ­ence by an unknown process. Nothing was discovered that failed to accord with it, and no other hypothesis seems tenable in view of the results". In plain language the above simply means that the scientists of the department of psychology of Duke University have stated in print their conclusion that Mrs. Fonda's horse was capable of reading a person's mind. 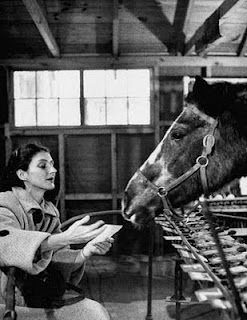 Lady Wonder, thanks to Dr. Rhine, became the most famous non-racing horse in the world, and helped her owner earn fabulous fortune. This wonderful story of Lady Wonder was featured In newspapers and magazines, including a spread in the LIFE magazine. The 1956 July Issue of CHALLENGE credits Lady Wonder with aiding the police in finding the dead body of a young boy. It is estimated that Lady Wonder, since the day that Dr. Rhine pronounced her psychic, has been seen and talked to by 1,50,000 visitors who came to seek her help to solve their problems. As the fame of Lady Wonder reached Professor John Scarne in New Jersey, he decided to investigate the case himself. One afternoon Searne visited Mrs. Fonda's farm in the company of Donald Grey. They waited till the crowd of people who were having their minds read thinned out, and entered a tent in which there were Mrs. Fonda and the three-year-old filly Lady Wonder. Lady Wonder was standing in front of a table on which were arranged several rows of lettered wooden blocks each showing one letter of the alphabet. Mrs. Fonda explained to Scarne and others there that Lady Wonder, after reading their mind, would answer the questions by spelling out the answers. She went on to explain that the horse's nose would touch one letter at a time and thereby spell out the answer to the question. Scarne did not say a word but just tried to look interested in a police officer in uniform talking to the horse. This officer had come from Chicago to consult Lady Wonder to solve a bank robbery. He asked the horse, "Lady, do you know why I came". Lady Wonder nosed the blocks and spelled out YES. He then asked in a nervous voice, "Lady Wonder, how shall I go about it?” Lady Wonder then nosed the letters WORK. The police officer then asked in a begging tone, "I am sorry Lady for asking so many questions, but please tell me where the robbers are at present". The horse touched the letters C.H.I for Chicago. It could not complete the word because 1he letter C would have to be used twice, which meant Mrs. Fonda would have to move the block C in its original position. She made it a practice never to come in front of the horse during performance. The police officer then turned to the horse and said, "Thank you Lady. You have been of great help to me". Mrs. Fonda then told Scarne to ask any question he wished. How do I do that?" Scarne asked. Mrs. Fonda replied, Just say, Lady please tell me how did I come here?” Scarne repeated the question. Lady wonder moved her head a bit, and then dropped her head close to the lettered blocks on the table. After a few seconds of hesitation Lady's nose pushed the blocks marked C. She brought her head upward again, then down again and the nose pushed the block marked A. Next she pushed R. The three letters spelled out the word CAR. Mrs. Fonda seemed stumped for a moment, then handed over a pad and pencil to Scarne and said, "Write your question in this pad, and don't let the lady see it". Scarne wrote the question on the pad, but did so without Mrs. Fonda seeing it. Mrs. Fonda looked a hit disappointed, but turned to lady and asked her to answer professor Scarne' s question. The horse did not move its head, and the reason was obvious to Scarne. After a few minutes' wait Scarne realized that if Mrs. Fonda did not see his question, the horse was not going to push the blocks with her nose. So Scarne decided to let Mrs. Fonda get a glimpse of the question without his apparently knowing what she did. As Scarne turned to talk to his friend Grey, he surreptitiously turned over the pad so that Mrs. Fonda could read the question, which read "Where do I live?” Scarne turned around after he was convinced that Mrs. Fonda had seen the question, and immediately Lady Wonder started to push around the blocks and spelled the word NEW YORK. Scarne acted surprised and said, "That is wonderful. How did Lady know that I lived in New York?" (Scarne actually lived in New Jersey). Scarne gave Mrs. Fonda her fee - five dollars - and left with Grey. As Scarne was driving back he could not help but wonder if it were true that the professors from the Duke University had been fooled by such an obvious bit of horse­play on the part of Mrs. Fonda. According to Scarne, the only clever thing with Mrs. Fonda and her mind-read­ing horse was Mrs. Fonda's salesmanship in duping the professors. “Mrs. Fonda carried a small whip in her right hand, and she cued the horse by waving It. I detected Mrs. Fonda doing it every time the horse moved the lettered blocks with the nose. This method of doing the trick might have puzzled me if I hadn't known that the placement of horse's eyes on 'either side of the head gave them wide backward range of peripheral vision. Therefore it offered no problem for me to detect. "Mrs. Fonda, when cueing Lady Wonder, stood about two-and-a-half feet be­hind, and approximately at a 60-degree angle to Lady's head. The shaking of the whip first time was the signal for Lady to bend her head within a couple of inches to the blocks. A second shake of the whip was the cue for Lady to continuously move her head in a bent position back and forth over the blocks. When Lady Wonder's head was just above the desired block Mrs. Fonda made the horse touch the block with her nose by shaking the whip a third time. It was as simple as that". (The Amazing World, pp. 247-53). It does not surprise me that Professor William McDougall was duped by a trick­ster woman and her trained horse, but I am surprised that Dr. J.B. Rhine who is a biologist should have forgotten the fact that a horse with its laterally placed eyes could see what was taking place behind it. With the publication of Professor Scarne's investigations came the end of Lady Wonder's mind-reading career. For the sake of maintaining a high degree of integrity for his researches and writings it was the duty of Dr. Rhine himself to have given publicity about his failure to detect the fraud practised by Mrs. Fonda. After all, scientists, unlike Popes, are not infallible. Had not Professor John Scarne exposed this hoax, still the world would have believed, on the authority of Dr. Joseph Banks Rhine, Director of Parapsychol­ogy at Duke University, that telepathy occurs even among animals. Since the name of his research laboratory was linked up with the widely publicized "submarine telepathy", which was later proved to be a carefully planned fraud, was it not the duty of Dr. Rhine to have published a disclaimer? His absolute silence with regard to these two frauds, with which his names was connected directly or indirectly, gives sufficient room for people to suspect Rhine's integrity. It´s incredible how those who dare to question the established boundaries of the "established Science" are immediately accused of forgery or naiveté. This text proves that Inquisition is still alive and kicking in our days. You're saying we should go into drool mode and accept every nutcase claim uncritically? I wouldn't think to suggest that an animal not able to think freely could not possibly be psychic. I do think, though, that it's a pity that Lady Wonder couldn't talk, because then she could astound people with her gift without Ms. Fonda being around to prompt, I mean, help. I just watched a program entitled Mysteries at the Museum on the History Channel. I saw this story and Googled it as well. In Mr. Kovoor's debunking article he failed to report that blinders were used on the horse and blindfolds as well. Unless cues from the owner were high frequency,in my opinion, the horse would not have been able to respond with the aid of her owner. In locating bank robbers and lost children, the owner would not have been privvy to this information at all. In the book entitled THE EMOTION CODE the doctor who authored this used a pendulum to find out just why a healthy horse was off her feed even with her favorite goat beside her. The horse had been checked by the vet and no one could find anything wrong with her that would affect her being off her feed. When he used the pendulum he discovered that the words "baby bird" came to his mind while standing beside the horse. The owner was astounded to reveal that a baby bird had fallen from its nest in their barn and their horse had witnessed this. With the help of this doctor and his EMOTION CODE he was able to get the horse back on her feed. Other documented reports within this book show how the doctor was able to help assist small pets who had survived horrendous traumas such as coyote attacks, and human abuse. He was able to help these animals recover.